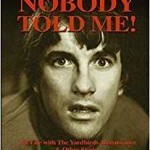 Share the post "Book review: JIM McCARTY with DAVE THOMPSON – Nobody Told Me: My Life With The Yardbirds, Renaissance and Other Stories"
‘Nobody Told Me’ is a suitably titled autobiography that documents the life and times of Jim McCarty, The Yardbirds founder member, drummer and rock and roll hall of fame inductee. ‘Nobody Told Me’ is a suitably titled book because McCarty embraces the role of what sociologists call participant observation, while his recall of his colourful past is shot through with a Zen like quality that always looks for the positive in the face of adversity. Then there’s the musical events that come to shape the author’s life, as The Yardbirds outgrow their blues and r&b roots to embrace rock, pychedelia and even heavy metal, while years later the quintessential English band morph via countless line-ups into becoming an American outfit still helmed by Jim McCarty of course. Deep in the book the author succinctly summarises the real legacy of the band as: “It was what we made possible for others to accomplish.” And he elegantly takes us through the chronology of the band’s evolution via an insider’s view of how it all happened. Co-author Dave Thomson helps provide the balance. He’s already known for penning Clapton, Cream, Beck and Plant’s biogs and here he provides the literary framework for Jim’s consistent inner voice. The book also uses the clever literary device of running one chapter into the other via portentous summaries that lead into further the twist and turns in the band’s career. ‘Nobody Told Me’ plunges us into the unsuspecting world of Jim’s South West London suburbia, an orderly place in which the generation gap is illustrated by his mum laughing his favourite record Chas McDevitt’s ‘Freight Train’. There’s tales of his early band The Country Gentleman, and end of term dances at Hampton Grammar school in an era when trad jazz and pop held sway. A Jimmy Reed album provides a musical glimpse of something more exciting, though when initially confronted with the early Stones he’s bemused. There are tales of countless US tours, of gigs where sometimes: “I could see more tumbleweeds than fans”, and of support bands that played half The Yardbirds set before the real band went on. The last third of the book is really about Jim McCarty’s struggle to find a niche for his natural creativity within a changing musical backdrop. There are the dashed hopes of Renaissance, the “superstar circus” of Box Of Frogs etc and a return to his R&B roots with Ruthless Blues. There’s also an unexpected tour of the States with the British Invasion All Stars and a further reconnect with Top Topham for low key pub gigs, and a left field dabble in New Age music, before an eventual triumphant return of The Yarbirds, who are asked by Jeff Beck if he can play on their all-star album. ‘Nobody Told Me’ is an enjoyable read, both for Yardbirds and rock fans in general. It could have done with a few more photos and certainly an index, but it’s still a compelling bird’s eye account from a drummer who helped shaped one of the most significant bands of our time and whose dependability and karma go a long way to explain his musical longevity. This entry was posted in All Posts, BOOK REVIEWS and tagged blues, book, Box of Frogs, British Invasion All Stars, Chas McDevitt, Chris Dreja, Cream, Dave Thompson, Eric Clapton, Georgio Gomelski, Jeff Beck, Jim McCarty, Jimmy Reed, New Age Music, Nobody Told Me, Peter Grant, psychedelic, R&B, Renaissance, review, Robert Plant, rock, Rolling Stones, Ruthless Blues, Simon Napier Bell, The Country Gentleman, The Yardbirds, Top Topham. Bookmark the permalink.